For those with web knowledge: I have my own homepage. Even if the page isn't viewed by many people, would the very presence of a link to here help the search engine ranking? From what I am reading, a link from an important page can raise the importance of the page linked to.... All of my pages are rated zero/10, except my Renaissance Faire pictures page, which has a webring link, and is rated 1/10. The Cafe Tropico pages are rated from 0 to 4. That's right - and it is important to note that the scale used is not linear. A link from a page rated "5" is worth, perhaps, 100 from pages rated "4". No one knows the actual figure - Google release enough information to understand how it works in general terms but not (obviously) the formulas used. Whilst your doing a little studying you may want to read the article on Google Bombing on Wikipedia - if nothing else it highlights the importance of having consistant linking text. I have added a new webpage listing the Ranks used on this board. It can be accessed from the side-menu. Speaking of Ranks, are those in the upper levels going to get a little graphic anytime soon? How can I properly flaunt if I do not have a shield or something? and I will probably rise up the ranks quite quickly given TWG is a post montster and I participate in nearly every game. When did you install the whole language package? I now can make my board preference Icelandic or German. 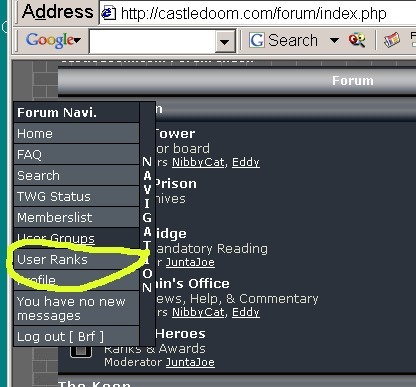 If someone gets banished from Lewis Media forums, what does it look like? Do they drop you an e-mail, or do you just discover it when you try to visit the site, but you can't? Do they give you an error screen? What is a "Lewis Media" forum? I would avoid other languages on this forum. There might be missing words in other templates besides SubSilver. For some reason unknown, the author of this ranks page put in a recursive subroutine call. For those who know what I am talking about, his setup was OK, so he avoided a stack overflow.... but the version of php we are running will not allow it at all apparently. Once I removed the extra call (which was redundant as far as I could tell) it worked OK.
Ok, I looked at the ranks page. wow, that's nifty. What does the rank of Fridge mean? LOL.... that was the rank I gave Amanda, when she first joined here.... She requested a regular rank though, so I took it away. Hello? Not sure if this request goes here, but can we create a thread in the Theatre forum to comment on people's threads? I see a couple of requests but no action taken. The problem is that the Theater's permissions are set so that only the person originating a given thread can post in it. A discussion topic would have to be set up outside the Theater. Query: Would it work to have a sticky thread in the Great Hall that would be our Blog comment topic? Yes! I love your hair! I don't have much hair these days, and even if I did, I wouldn't have the balls to go to my very conservative job with such fun hair. So I'm green with envy. And I think that's a good idea. I'm a bit rusty on how boards work but you can have a comment thread in the Theatre with an link inside it to the actual comment thread in the great hall. Yes, we could do that. But I'm a bit resistant to doing that just yet. The mini-blogs are still somewhat in the trial phase and I'm loathe to mess with them right now. The mini-blogs are supposed to be about self expression. If you just wish to converse with someone over something then simply start a discussion thread in the Great Hall for now. Yes, I've always told everyone to make good topics when they can, but sometimes a short conversation is all you have in you. So make the "hair" topic, do a few posts on it, and let it drift down when you've finished talking about it. If mandating thesis quality thread material was required here then we'd have a mostly empty board. If someone says something in a mini-blog that encourages you to talk about it then pm them or start a thread. If they don't wish to respond then we all just move on.